It’s 1st of january 2013! Last night we had our friends around for a New Year celebration ! 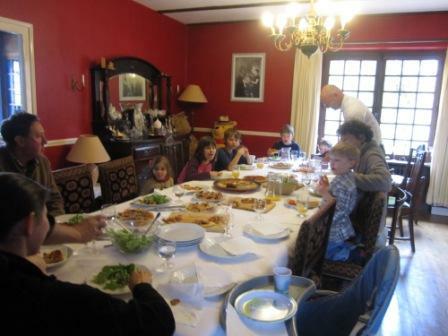 As a tradition here at La Croix du Reh the New Year’s night dinner is all russian cuisine! however, we made a couple of french (foie gras) and british ( roast potatoes) additions to our table this year. And as per russian tradition we had a assortment of winter salads for starters, the Beef Stroganoff with roasted potatoes, green beans and mushrooms à la Russe and of course 2 cakes “white” and “black”. Both cakes were appreciated by our guests. Little they know, that both cakes were made with the same base recipe My chestnut purée cake and it was the filling that made both cakes so different one from the other. Chestnut purée and chocolate cake. Divide the mixture into tree equal parts and bake in two separate 21cm -26cm buttered and lined tins and bake in preheated 170°C oven. Once the bases are ready, remove the tins from the oven, cover with a tea towel and leave to cool on the rack, without taking the cake bases out of the cake form. * It is possible to bake the mixture in one tin and slice it into three after it’s cooled down. 4. Prepare the filling by whisking sweet chestnut purée, cocoa and soft butter until light and fluffy. 5. Prepare the chocolate frosting. Heat the cream and sugar to the boiling point . Add the chocolate, broken into pieces and mix well until smooth glossy ganache achieved. 6. Set ganache aside to cool completely. 5. Arrange the first cake base on the plate , cover generously with prepared filling and sprinkle with hazelnuts. 7. Arrange the third cake base on the top. 8. Whisk cold ganache until light and fluffy and pipe or smudge it all over the cake. 9. Put cake into the fridge for at least couple of hours to set or until ready to serve. I wish you all the best in 2013: good health, peace and love! PS Find the White chestnut cake in my recipe section. Chesnuts here, chestnuts there, chestnuts everywhere! 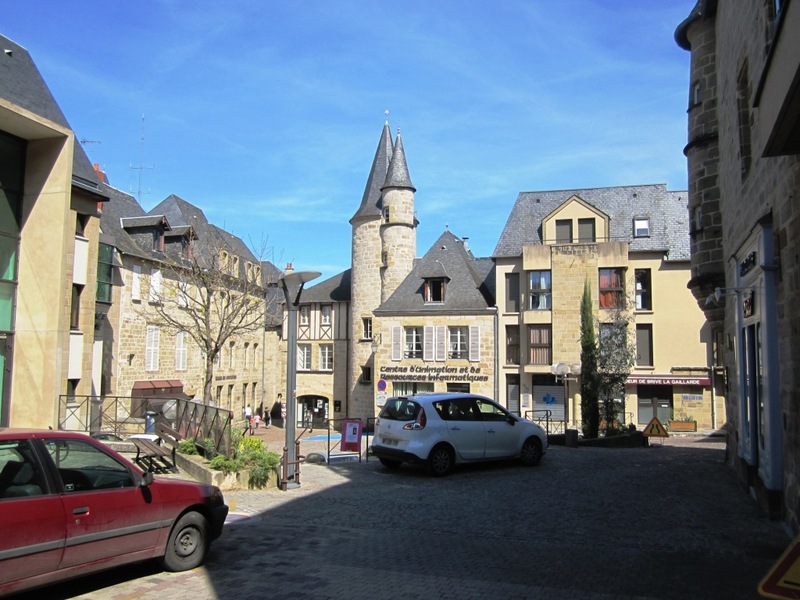 Limousin region, where myself and my husband Peter are living and running our wonderful Bed & Breakfast La Croix Du Reh now for nine years, is known for its meat production, especially the world-famous Limousin beef. It is the region of nature with plenty of forests, rivers and lakes. Hundreds of mushroom pickers come from other regions every autumn. Also Limousin is one of the main producers of chestnuts in France. 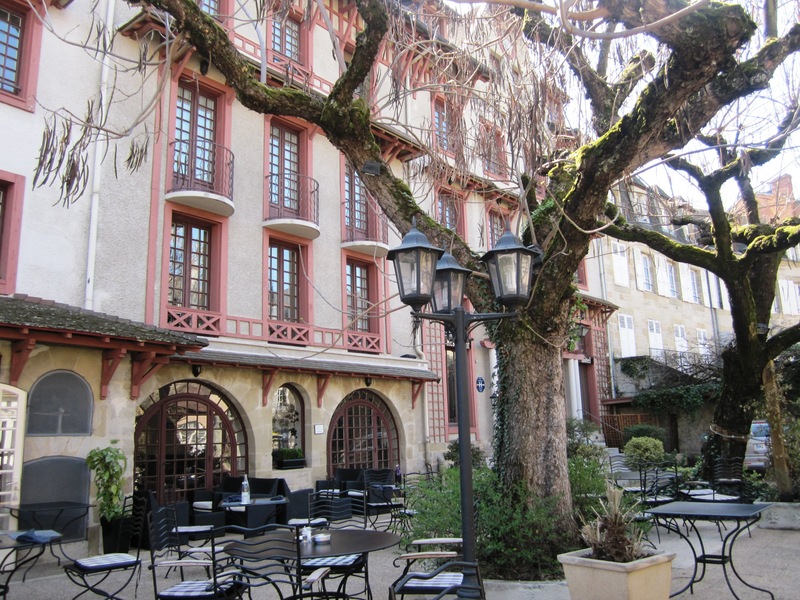 The chestnut tree is very symbolic for Limousin: the regional logo of Limousin is represented by a chestnut tree leaf and chestnut trees are also used as a building material with many old houses having been adorned with beautiful chestnut parquet floors and staircases. Chestnut trees are called sometimes ” bread tree”, because chestnuts were a major, if not the only part, of a local diet during the hard times of food shortages. It is therefore no surprise that chestnuts are still widely used in the local cuisine. 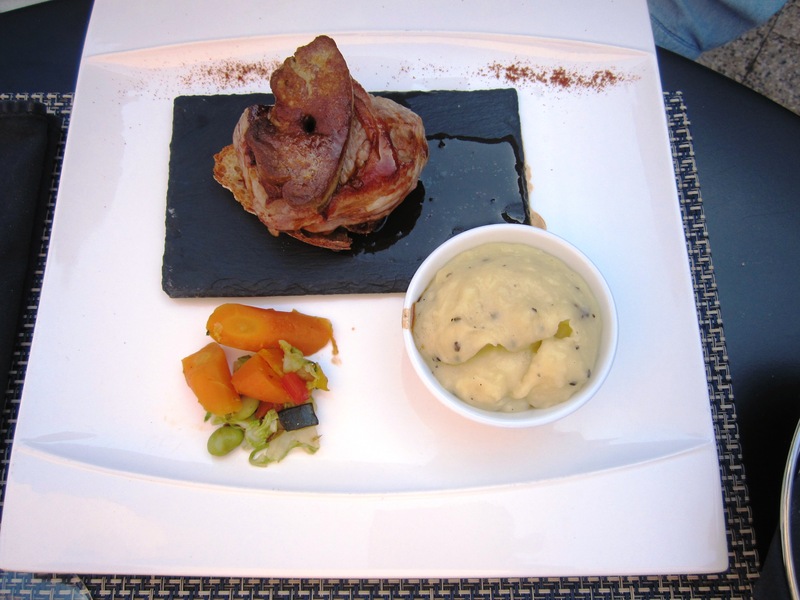 The course was called “Cuisiner Limousin”. 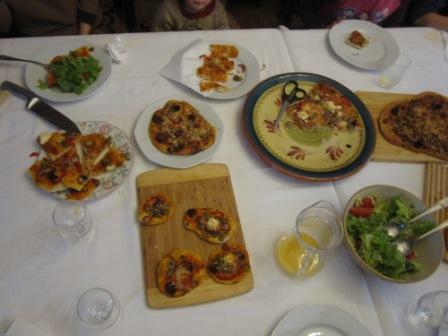 The idea is to get experience in cooking regional Limousin cuisine using as much local produce as possible. Of course half of the dishes that we discovered used chestnuts. All this and pre-Christmas thinking about what to cook for Christmas or New Year celebration inspired me to come up with a Chestnut spread (puree) cake recipe. What I have come up with is a gluten-free version, very much like my Tired Fruits Cake. But if you don’t want to use ground almonds, please feel free to substitute them with white all-purpose flour. 2. Whisk softened butter and sugar, then add all the other ingredients and mix well. * You don’t have to use a food processor. I use it because I have one and it makes the preparation quicker. 3. Butter and line a 21cm 26cm springform tin. I use silicone cake 26cm form, that does not need neither greasing nor lining. 4. Pour the cake mixture into it. Bake the cake for an hour to an hour and a half, or until it feels more or less firm to touch. 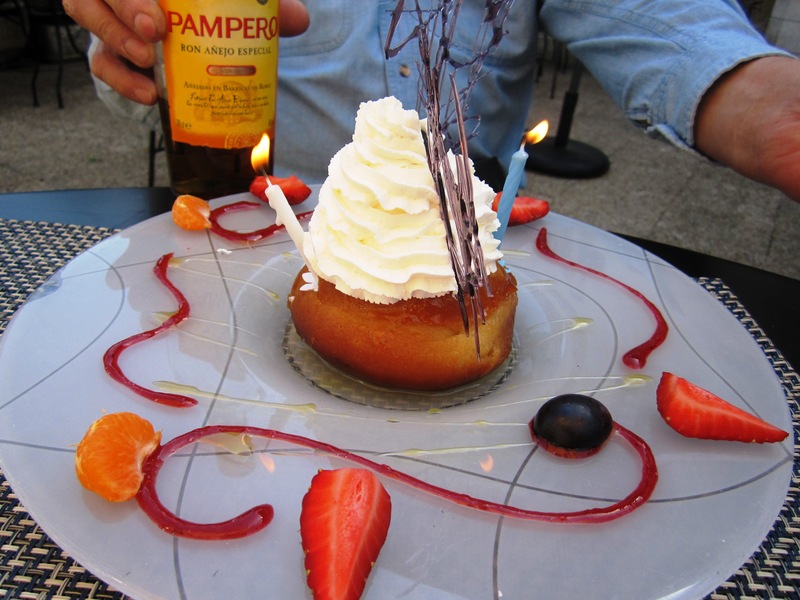 If it starts burning on the top, cover with foil or greaseproof paper. 5. Remove cake from the oven, cover with a tea towel and leave to cool on the rack, without taking it out of the cake form. If preparing in advance, you can leave the cake to cool down over night in the oven after switching the power off. In the morning put it in the fridge without removing it from the form until you want to decorate it. 6 Whip the cream with sugar and vanilla and decorate the cake to your taste with a few candied chestnuts scattered on the top. BON APPETITE! I love Christmas! Everything changes for a few weeks and becomes prettier, glitterier, tinselly….. I know, I know, these words probably don’t exist in the dictionary. But that is the point: it’s Christmas! Everything is possible! Magic? Magic as well! If anybody says to me that they don’t like Christmas, I simply don’t believe them. But if people like this exist and they read this blog, please stop reading: this is not for you! This is for the ones who love magic! Foie gras with Port jelly. Alongside oysters, smoked salmon, langoustines, prawns etc… foie gras is one of the most traditional hors-d’œuvres or starters on the French tables at Christmas. Of course it would be nice to prepare foie gras from scratch. But why make it more difficult for yourself at an already stressful time like Christmas, when you can pick up a perfect ready-to-cut bloc of foie gras in the shop? Of course, when I first saw how many varieties of foie gras are on offer, I was more than a little daunted and entirely lost. Fortunately in our local supermarket we have very helpful staff who will give you advice and so far, in nine years of our being here in a rural south-west central France village, they have never let us down. Oh, yes, supermarket, nothing wrong with them! (But that is a subject for another blog post). 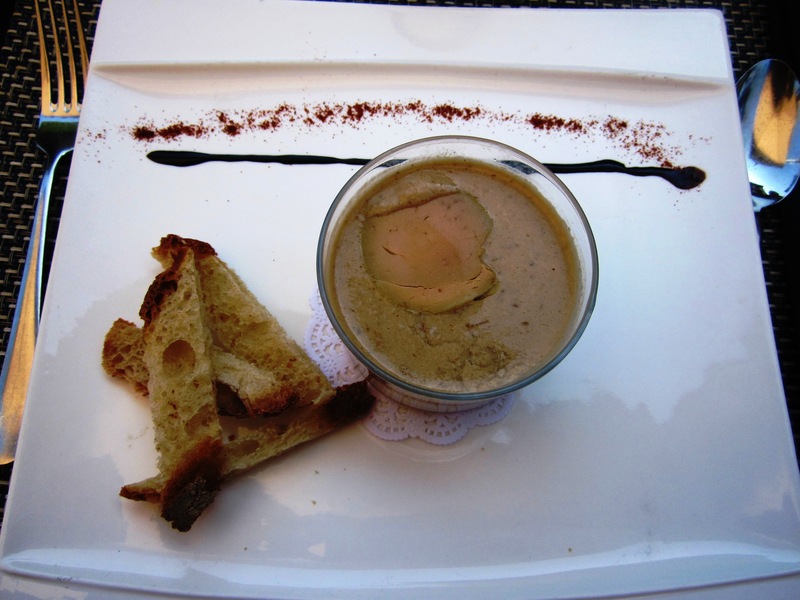 The price range of a good foie gras is between 28€ and 40€ per kilogram. Sounds expensive, but not if you serve just 30gr per portion, which is quite enough for a starter. After all, you don’t want to eat too much of it when there other yummies waiting to come to the table. Traditionally the French eat foie gras with toast and confit d’oignon, echalotte or figue (onion, shallot, fig) or any other chutney. And, of course, there is plenty of all sorts in the shops. I also make my own “not quite chutney” that I had in mind for my starter. Somewhere on the internet I came across a menu where foie gras was served with a port jelly, and I thought: “What a good idea!” I found a few recipes, but none of them tickled my taste buds, so I decided to make up one. Optional: to “christmasize” it a bit more, add a couple of cloves, 1 cinnamon stick, star anise or any other festive spices. Bring water, spices (if using), sugar and berries to boil and simmer for 10 – 15 minutes. Take the mixture off the heat and drain the liquid into a pan. Let it cool down for 15 – 20 minutes. Do not squeeze the fruit, as it can make the jelly cloudy, but keep it aside. After about 20 minutes, add gelatin into the pan with the warm juice from the berries and, stirring with a whisk, bring it gently to the boil. Then add the port , simmer for 1 minute and take it off the heat. If using leaf gelatin, soak the gelatin sheets in plenty of cold water for 5 – 8 minutes, then squeeze them to get the excess water out and add to the fruit juice. Leave the mixture to cool to room temperature. Meanwhile, slightly oil the shallow tray (or jelly moulds, if using) with a little sunflower oil or any other neutral (no flavor or odors) oil. I use silicon moulds for chocolates or mini-cakes. Pour the warm jelly into the moulds or into the tray, so the jelly would be about 1 to 1.5 cm deep and put to cool in the fridge. Once cold, and just before serving, turn the tray over onto the board covered with clingfilm and cut the jelly into squares, or any desired shapes, or, if using moulds, simply turn them over straight onto the plates. Serve as needed as an accompaniment and decoration with a slice of foie gras and a couple of slices of fresh toast. *If you don’t have any frozen red berries, a good black cherry jam like would do a great job. In that case, add only 50 gr of sugar, taste it and, if it is not sweet enough add some more sugar. 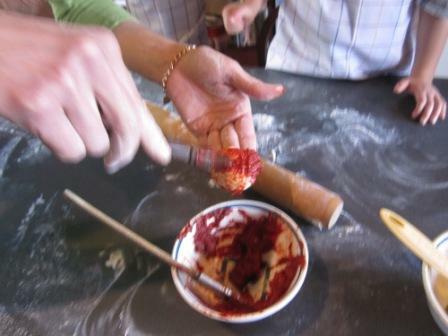 *If jelly did not set well and is too wobbly to take out of the moulds, you can re-heat it and add some more gelatin. Running a Bed and Breakfast in the rural area of France like Limousin, where tourist flows are limited to the warm summer months, has proven to be somewhat difficult out of season. There are no holiday makers and, since the global crisis, not many house hunters either. Luckily, this year, we are pretty busy for spring time. 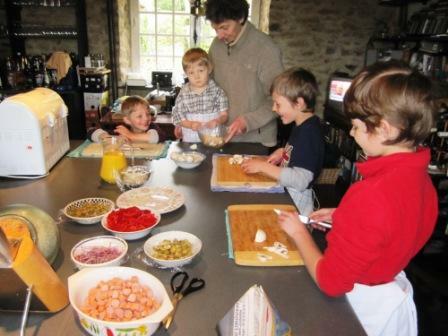 School holidays in the UK have started and many families that have a holiday home in France use the two-week break to relax in the Limousin. Recently, some of our friends came over for a “cuppa” (a cup of tea to the non British reader). It was just after Easter and the festive “chocolate bunnies hunt” spirit was still in the air. 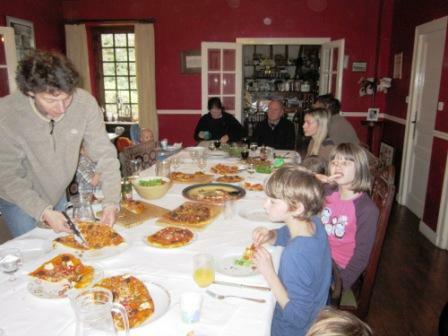 As all our friends were coming with their kids, eight in total, none over the age of eleven. This presented a serious dilemma: the adults were coming to catch up and would be happy to lounge around, drink, snack and talk, but what about thekids? Then, I remembered something. Last year we went to Australia to visit our family there. One of the most memorable days of our visit was a Family gathering at Derek’s and Helen’s (my husband’s brother and his wife’s) house. 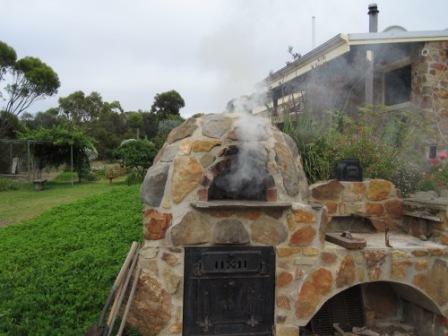 Years ago Derek built a wood-fired bread oven, which was the top attraction on the day of our gathering: we were going to bake proper, home-made pizza! 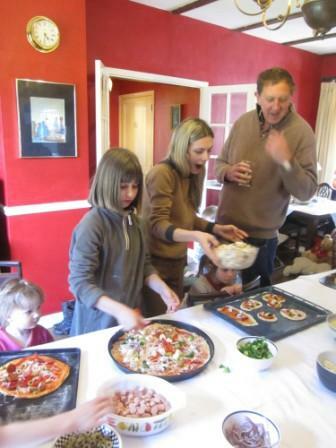 Everyone made their own, to their taste, out of the prepared ingredients and, believe me, there was plenty of choice… Remembering how much fun it was, my decision was made easy: I knew what I was going to do with the kids while Peter (my husband) entertained the parents. 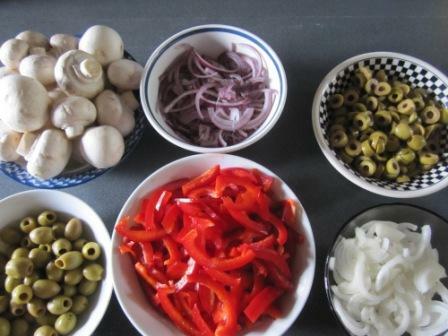 I prepared plenty of dough and got a few ingredients for toppings, cut the most fiddly ones, like onions and olives, myself and voila, I was ready – bring it on! It is amazing how resourceful one can be with a little bit of thought: we improvised pinnies from kitchen towels and they did the trick, the older kids were cutting the rest of the meats and vegetables while the smaller ones happily got mucky by using their hands to break up pieces of mushroom (which also meant that the parents were not worried about them cutting themselves on sharp knives). 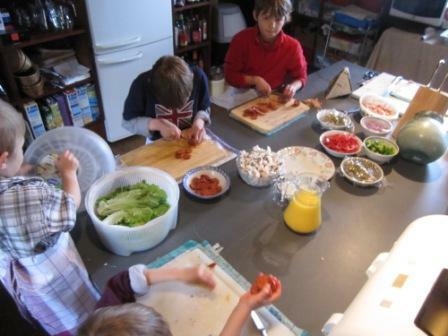 In the end, everyone wanted to do something, everyone wanted to make pizza! When all vegetables and meats were prepared and put into bowls, we lined them up on one long table and started preparing the bases. 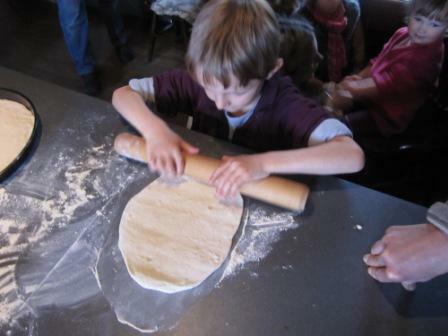 What fun this was: some of the youngsters were so proud and excited that they were working with a rolling pin for the very first time that they became very-very serious about it! 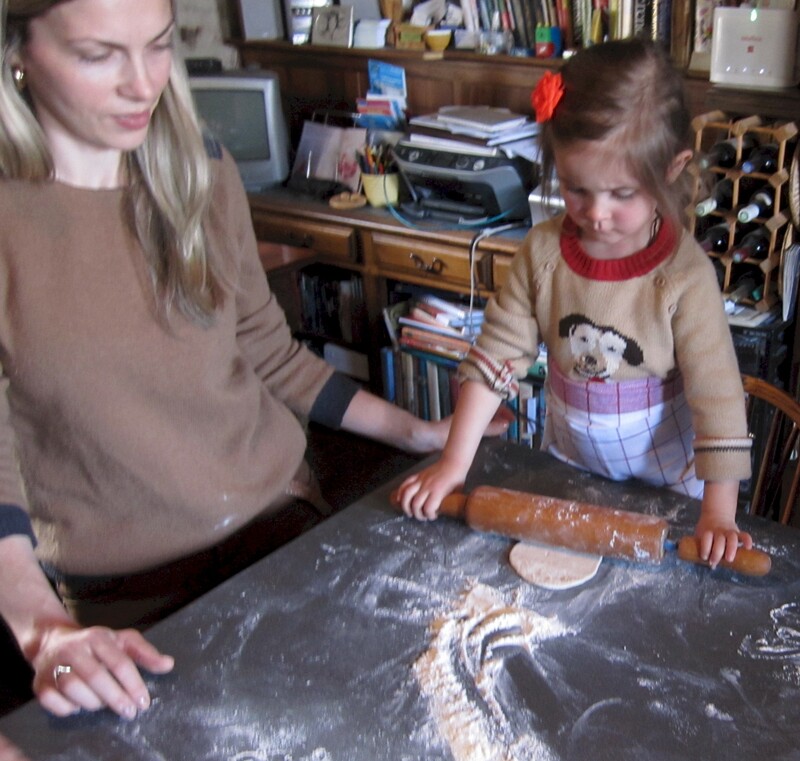 Of course, I did not have enough rolling pins, so learning how to stretch the dough by hand became even more fun and a source of proud achievement for the older kids. We “painted” the bases with tomato sauce and then lined them up. 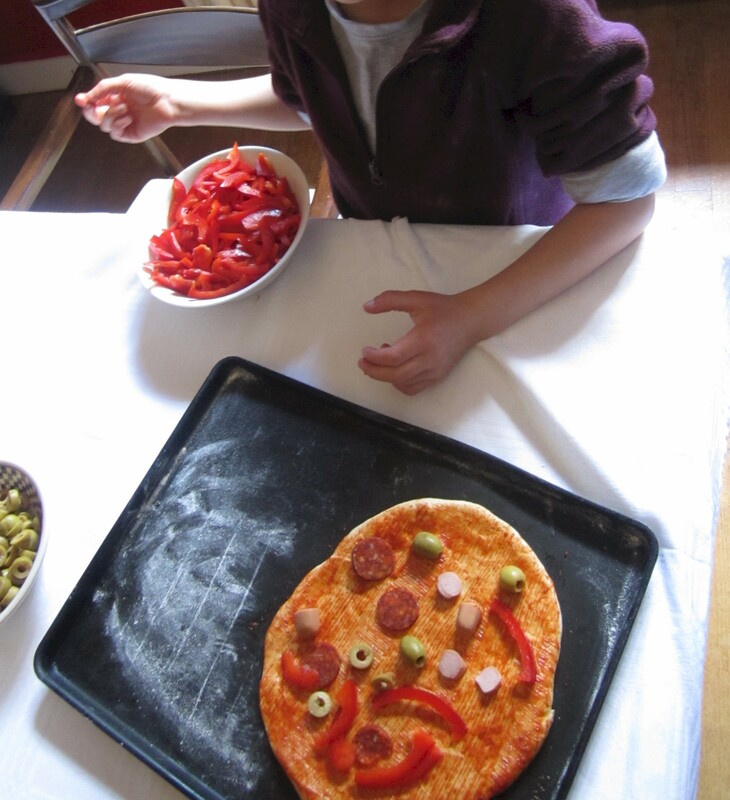 Then came to most artistic part of pizza creation: topping the pizza – I left it to the kids and their imaginations. After all 12 (yes, 12!) 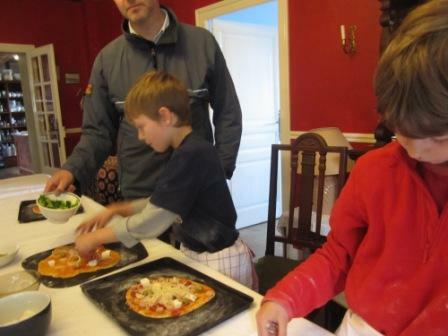 pizzas were ready to go to the oven, the kids had one other very important mission to accomplish: the local french “Bunnie” just went through our garden and left a message that there were still lots of chocolate eggs to find in the garden, so the children went Easter egg hunting while the pizzas were baking in the oven. Peter appeared in the kitchen from time to time to fill up the adults’ glasses and to make the odd comment of “You are really enjoying yourself, aren’t you!”. Of course I was enjoying myself – I loved, loved, loved it! I guess it reminded me of my old days working in a school in Russia, where to be a teacher was never a profession, it was a life style. 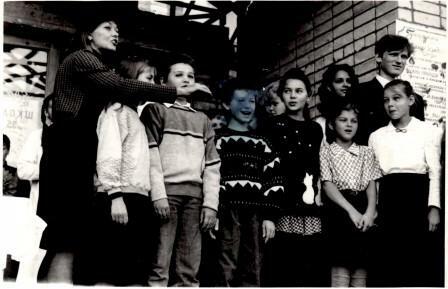 The teachers, the kids, the parents, all and everyone were part of one big family called school. There was always a special connection between us: there were lots of things we did together even after school hours: concerts, fetes, competitions, pantomimes, various trips, barbeques, summer camps, you name it – we did it. And how rewarding it was when one day the parents of one of the classes asked me to be a form tutor for their children and even went to the headmaster with a signed petition! Taking that on was enormous responsibility and very tiring and difficult at times (my door was open to the kids 24/7 if needed). But more than anything else it was so much fun, inspiring daily joy and life-long satisfaction. To be appreciated and respected by kids and their parents is probably one of the best feelings for a teacher of any description. 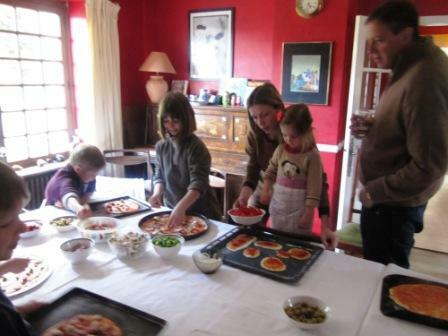 And here I am, 17 years later, in rural France, running bed and breakfast, but feeling just like when I was teaching in school – feeling great: excited, energetic, creative and buzzing! 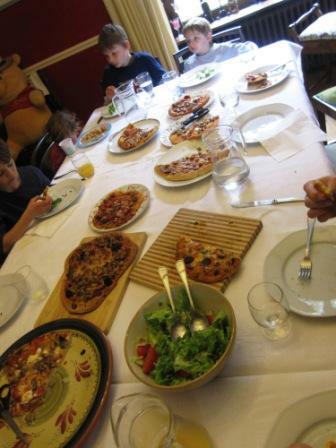 The Easter egg hunt finished and all the kids returned with handfuls of chocolate eggs and bunnies, proud of their findings and excited about the Pizza party! 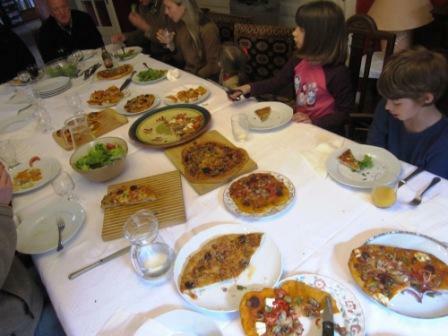 The table in the dining room was ready and all 12 pizzas all shapes and to all tastes arrived: WOW! “Wow” – was the verdict from the parents. 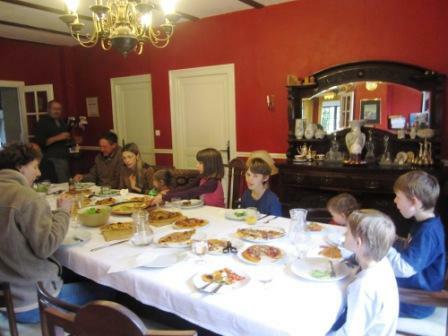 “Oh, Wow!” – the excited little faces around the table never stopped smiling. 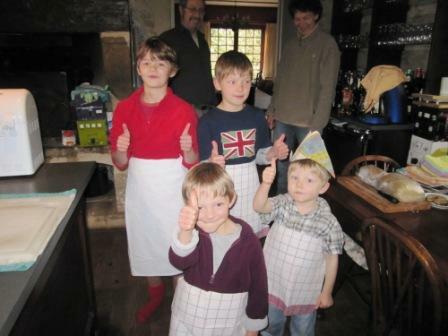 Everyone was happy and proud! What a great experience! It’s Saturday the 31st of March, Peter’s birthday: big 65.I booked a table for two in La Truffe Noire in Brive la Gaillard for lunch.Just an hour drive south from home, but what a difference to a landscape: most of the trees are already showing the newborn greens and the snow-white blossom has gently started enveloping the fruit trees like a bridal veil. The sun was shining in the blue clear sky and the warm breeze was gently kissing the skin through the open window – perfect day for a celebration! Brive la Gaillard is a fairly sizeable town. 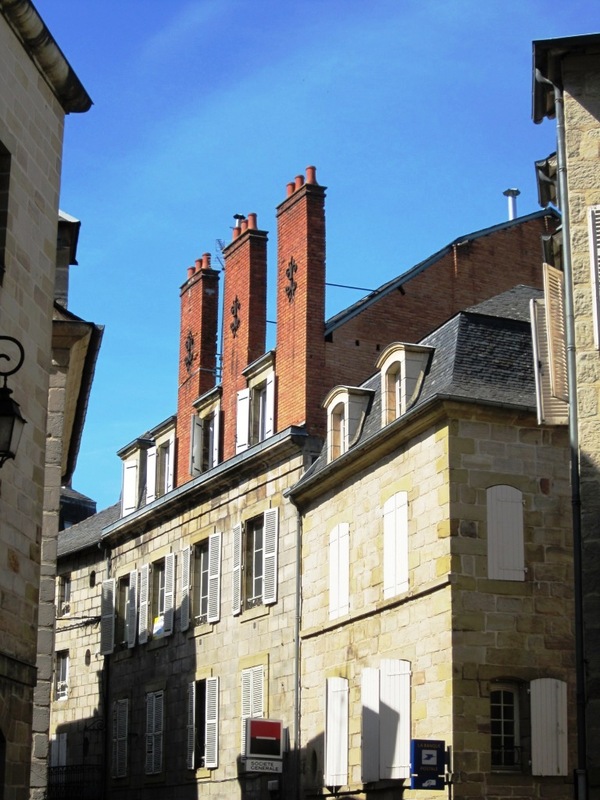 The beautiful old stone houses line the narrow streets, and the new-builds are carefully crafted to harmoniously join them with matching colors of local stone and slate covered roofs. The narrow one-way streets turning and turning, squeezing between the buildings, eventually lead us to the Hotel-restaurant. The young handsome waiter greeted us at the doors and started speaking in English as soon as he heard our obviously accented “Bonjour”. I replied to him in French; we are in France after all. We chose one of the tables on the terrace. Surprisingly there were few other patrons. 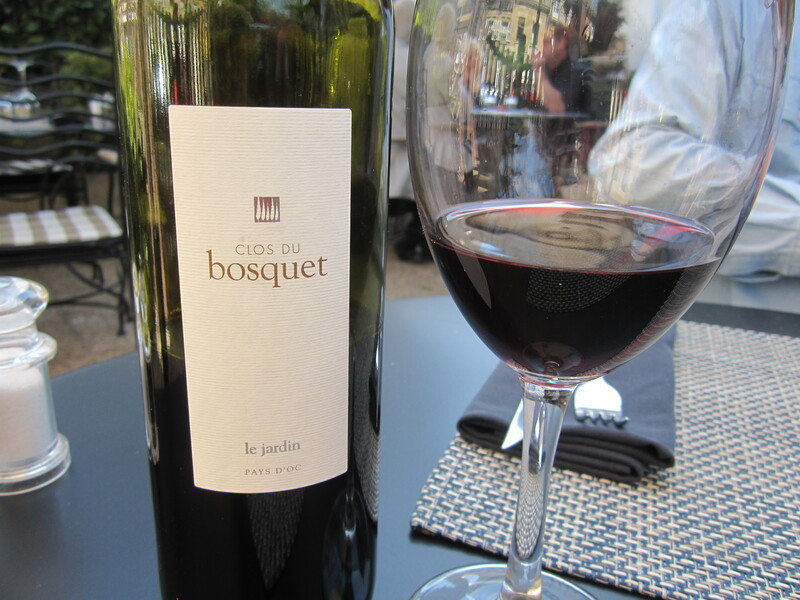 The “Handsome” took our orders and a waitress brought over our wine, or shall I say, Peter’s wine. Oh yes, he had the whole bottle of very nice light red for himself. I had to stick to my bottle of “eau minerale” as I was driving and it was his 65th Birthday after all. Cheers! The third waiter arrived with sets of folks, knives and spoons for our starters. It did feel special: so much fuss around the two of us. And here comes the starter: we ordered different food, so we can try each other’s. Peter had “Cassoulet lutèe d’escargots ” Gros Gris” Girolles et coulis de persil” – Snails and Girolles cassoulets in parsley coulis. 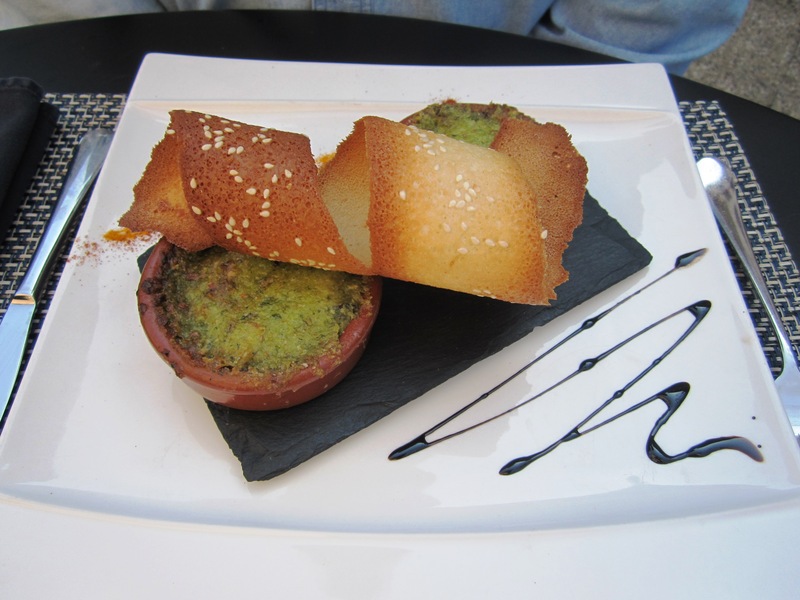 It was well presented and beautifully decorated with a sesamed curl of crunchy “paté brick” : it was absolutely yummy! I chose « Œufs cocotte sauce Cèpes et Foie gras » – pot of baked egg with cep sauce and Foie gras, which left me somewhat disappointed. Maybe, it was because I have made a similar dish for our guests at La Croix du Reh so many times that I expected it to be something truly special, especially for the price of it ( 14€ seemed to be a little too ambitious). The main course was really good: Peter was raving about his “Ris de Veau aux Cèpes” – Veal Sweetbreads with mashed potatoes with ceps and vegetables. For once my husband could not even speak, it was food from heaven! I don’t know how, but he has this amazing ability to pick the best dishes out of a menu, even if it’s written in French! 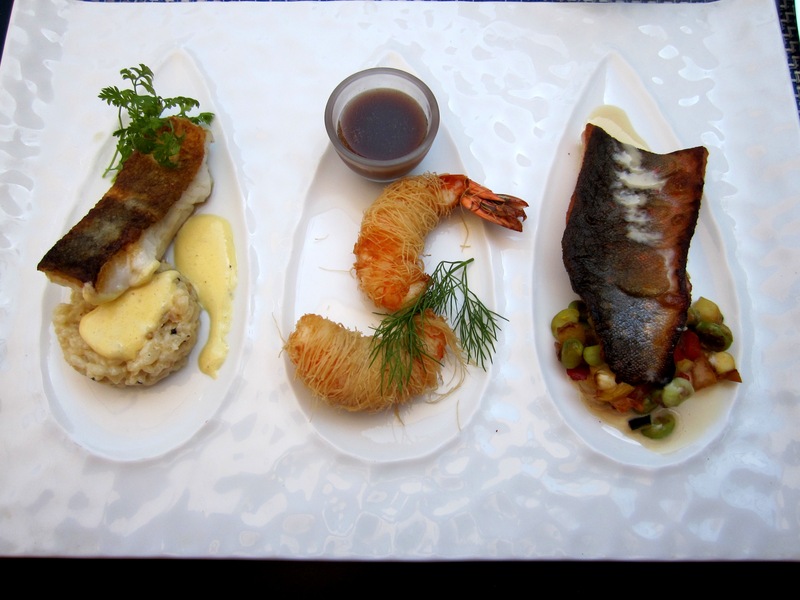 I had a “Découverte poissons” – “Discovering fish” which was a very tasty, melting in your mouth piece of sea bass on a risotto bed with white sauce , two grilled tiger prawns tails wrapped in glass noodles with an Asian style sauce and a filet of trout on a bed of vegetables. The fish and the prawns were succulent, juicy and the garnish for the fish was just right. Of course I sang “Happy birthday to you” to the amusement of the other diners! My dessert was a hot chocolate soufflé. The French are very proud of their chocolate and what they do with it and I was very excited about my chocolate dessert. The soufflé came with a chocolate cone filled with something that tasted like a chocolate butter and was very heavy and too sweet to eat. The top half of the soufflé itself was hot and the bottom half cold. My heart sank – what a disappointment! 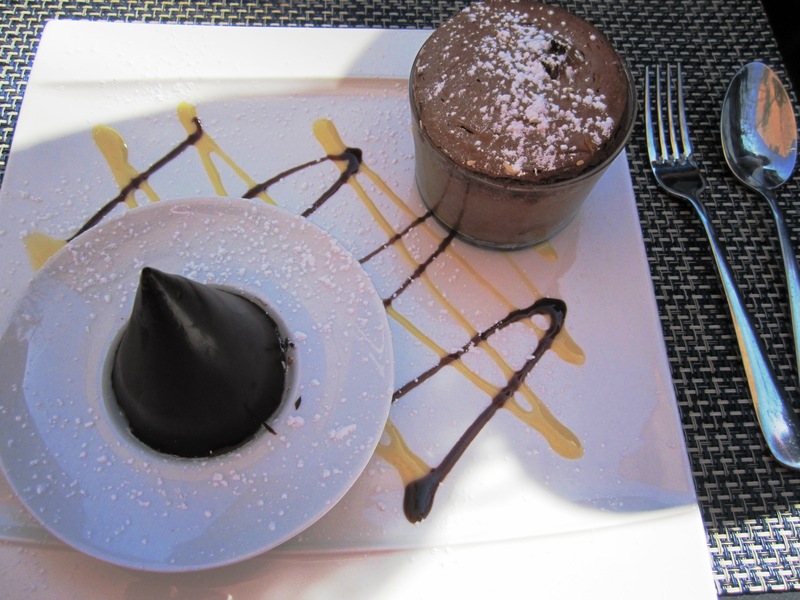 Soufflé chocolat chaud” – it looked fabulous when it arrived. Shame it did not taste up to presentation. And here we have the same restaurant the same chef, two different menus: one – the food of delight and the other – very average, overpriced and disappointing. To finish on a positive note: the presentation of all of the dishes was original and the staff is very friendly, attentive and not intrusive. We were the last to finish and the restaurant was closed, but no one was hurrying us to leave by glancing obviously our way to check, if we had finished: we were left alone and we were given privacy and as much time as we wanted. In addition, we were allowed to leave our car in the restaurant’s car park while we took a walk around the town.The town was hot, sunny and crowdied. 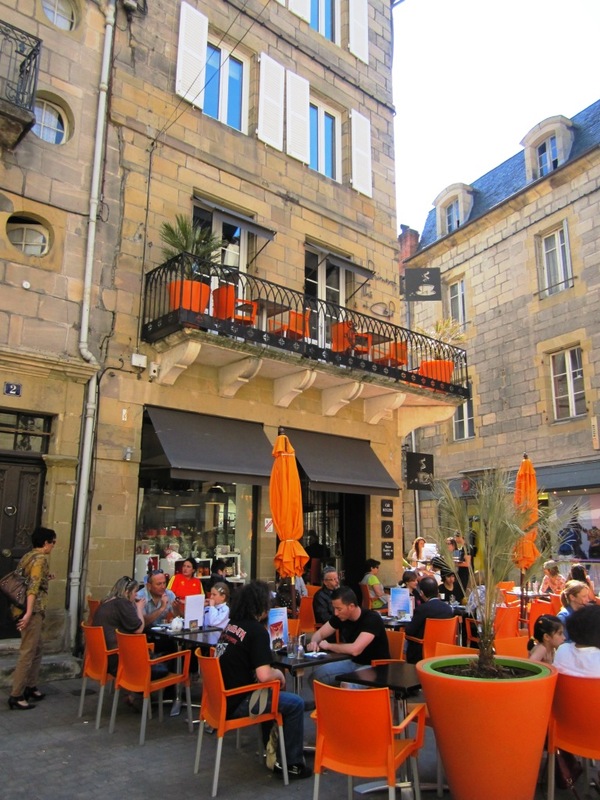 We walked around winding streets of the Brive centre looking at the shop windows and watching people enjoying the beautiful day out. Kids were running around just relaxed, happy and their giggles and laughter wer waking up the town still sleepy after a long and harsh winter. Spring was in the air and we enjoyed every second of it!